Are you still using Clicker 5? Upgrades to Clicker 6 are only available until December 2014. If you are a Clicker 5 user and have been thinking about upgrading to Clicker 6, time is fast running out. Clicker 6 is the child-friendly writing tool that enables students of ALL abilities to significantly develop their literacy skills. After December 2014, upgrade pricing will no longer be available. All Clicker 6 purchases will only be available at full price. Why would you want to upgrade to Clicker 6? First reason. 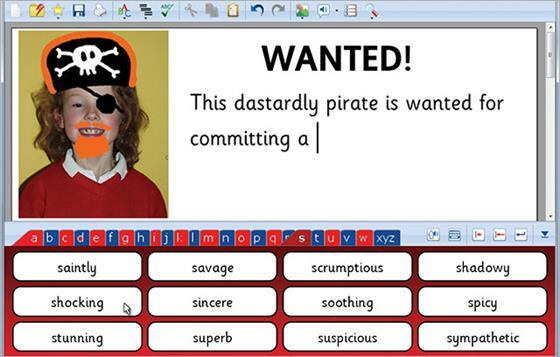 It is so much easier and quicker for you to use to create an infinite variety of on-computer activities to support literacy learning. What sets Clicker 6 apart from other word processors is the extensive support it offers to emergent, developing and struggling readers and writers. Which is why it is now used in thousands of schools around the world! Clicker 6 also gives you instant access to over a thousand ready-made resources on a huge variety of curriculum topics. Whether you’re looking for a talking book about coastal landforms, a bank of key words to support writing about endangered animals, or a writing frame to help your class review their favourite book, there’s a LearningGrids activity for you! New resources are posted regularly too. Spend ten minutes viewing the Clicker 6: My Favourite Things! video by the Spectronics team to quickly understand the many benefits of upgrading from Clicker 5. An even newer cool feature that we love is the “two-way-interactivity” between the growing suite of Clicker apps for iPad and Clicker 6, giving you mobile learning on-the-go options for your students too! Interested in how this works? Watch this video showing you how you can export your activities created in Clicker 6 on the computer to the Clicker Sentences and Clicker Docs apps on the iPad and vice versa. Please note that upgrade pricing is only available only until 31st December 2014. Contact us at Spectronics on mail@spectronicsinoz.com or phone (07) 3808 6833 if you have any questions at all about upgrading. Or if you require a quote. We'll hop onto it quickly for you! Pricing for upgrades to Clicker 6 ANZ for Windows and Mac. Available only until 31st December 2014.